SURREY COUNTY COUNCIL IN EXERCISE OF ITS POWERS UNDER SECTION 14 (2) OF THE Road Traffic Regulation Act 1984 and all other enabling powers hereby gives notice that no person shall cause or permit any vehicle to enter or proceed along the entire length of (D5511) Lion Lane, Haslemere (part of which is known as “Polecat Hill”). Access will be maintained for emergency service vehicles, pedestrians and residents at all times. This Notice is necessary to enable Surrey County Council to carry out urgent safety defect repairs to the carriageway. The closure will commence from 9.30am on 5th February 2016 for 1 day. Advanced warning signs will be displayed and the temporary closure will only operate when the relevant traffic signs are displayed. If necessary this temporary closure can be extended for up to a total of 5 days. The diversion route for all other vehicles will be via Lion Green, Junction Place and Hindhead Road. 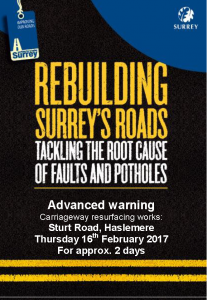 This entry was posted in Surrey News Updates and tagged Carriageway Repairs, Haslemere, Lion Lane, Road Closure on February 4, 2016 by admin. Woolmer Hill Road, from its junction with Sandy Lane south-eastwards for a distance of 50 metres and the second section will be from Woolmer Hill Technology College to its junction with Hatchetts Drive. Access will be maintained for pedestrians and emergency services vehicles only. The prohibition specified above is required to allow emergency carriageway patching repairs. This will commence on 27 May 2015 for a period of 1 day, but this period may be extended by the County Council up to a maximum of 5 days if required. Traffic will be diverted via Critchmere Hill, Hindhead Road, Portsmouth Road, Upper Hammer Lane, Woolmer Hill Road, or vice versa. This entry was posted in Haslemere first, Surrey News Updates and tagged Carriageway Repairs, Haslemere, Surrey County Council, Woolmer Hill Road on May 27, 2015 by admin.